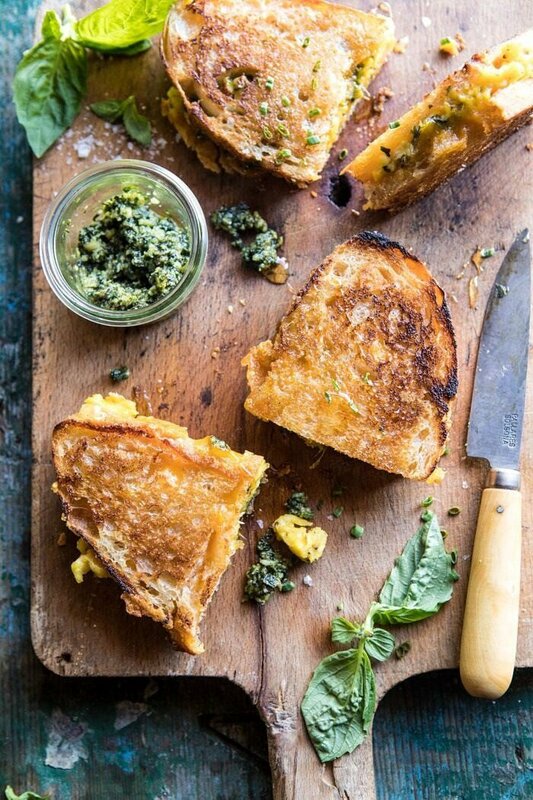 Soft scrambled eggs, fontina cheese, and basil pesto all sandwiched together between two slices of sourdough bread, then pan cooked and finished off with a drizzle of sweet honey. It’s breakfast perfection on so many levels and comes together in just minutes…great for both weekends and weekdays! I figured this was the perfect recipe to kick the week off with. This breakfast grilled cheese triples as an easy breakfast, lunch, or (breakfast for) dinner situation. It’s just an all around really great meal. Plus, after a long three-day weekend, I felt like a nice and easy (and cheesy) recipe like this would be ideal for easing us back into the work week, much better than say…a boring green salad. You know? You can totally thank me later. Speaking of the long weekend, how was yours? I also spent the weekend dealing with a mice situation, which was not all that fun. It’s seems that with the warmer weather, the mice have returned to my house and I’m not liking it one bit. To be real, it’s just gross. AND they (yes, they because there are multiple) seem way too comfortable with me, as they are not afraid to show themselves, make squeaky mouse noises, and run about. Eww, like what in the world is that about? Working to fix the issue, but’s it’s not an overnight fix, and in the meantime, I’m just over here (with my feet up) typing away. Probably not a story I should be talking about on a food blog, but it’s real life, and I’m sure many of you have been here. Anyway, aside from that little mousey situation above, I’m feeling excited for the new week ahead and so ready for June to come this Friday! Can you believe it’s already June? With Memorial Day behind us it’s full force summer in my mind. Bring on the heirloom tomatoes, summer squash, stone fruits, and all the berries, because I am ready. And OK, all the breakfast grilled cheese with basil pesto and a drizzle of honey. YUMMMM. For real though, this is a breakfast worth waking up for. 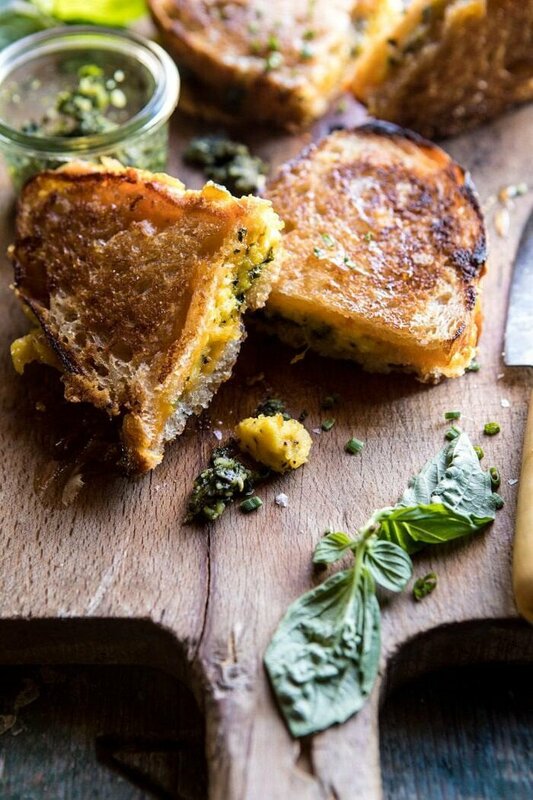 I mean, who doesn’t want grilled cheese for breakfast? It’s simply perfect, and I do think it should be considered a rather healthy breakfast with all those protein packed eggs and greens! First things, you have to start with the soft scrambled eggs. And soft scrambled is key. You want to be sure not to overcook the eggs because they will continue cooking inside the grilled cheese. It’s a two-minute cooking time tops, so watch the eggs closely. Also, I left the eggs pretty simple and only seasoned them with salt, but if you like things spicy, I’d add in some hot peppers or hot sauce. Have fun and use your favorite flavors. Double also, for extra rich soft scrambled eggs, stir in a tablespoon or two of mascarpone or cream cheese. It’s so delicious. OKAY. You have your eggs, now let’s make a grilled cheese! I like to use sourdough bread, but you can really use whatever bread you love. Just make sure it is something sturdy. 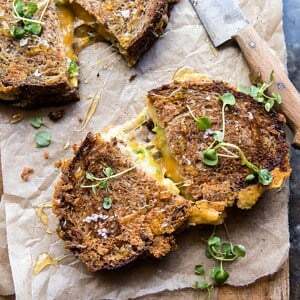 Layer the bread with cheese (cheddar and fontina please! ), then eggs, and lots of basil pesto. 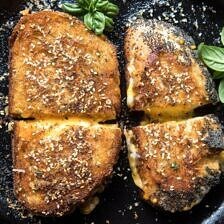 Cook in a skillet with a little butter and then finish the grilled cheese off with a sweet drizzle of honey. The honey might sound weird, but just trust me, it’s so unexpectedly GOOD. You have to do it. If you make this breakfast grilled cheese, please be sure to leave a comment and/or give this recipe a rating! I love hearing from you guys and always do my best to respond to each and every one of you. Oh, and of course, if you do make this grilled cheese, don’t forget to also tag me on Instagram so I can see! Looking through the photos of recipes you all have made is my favorite! 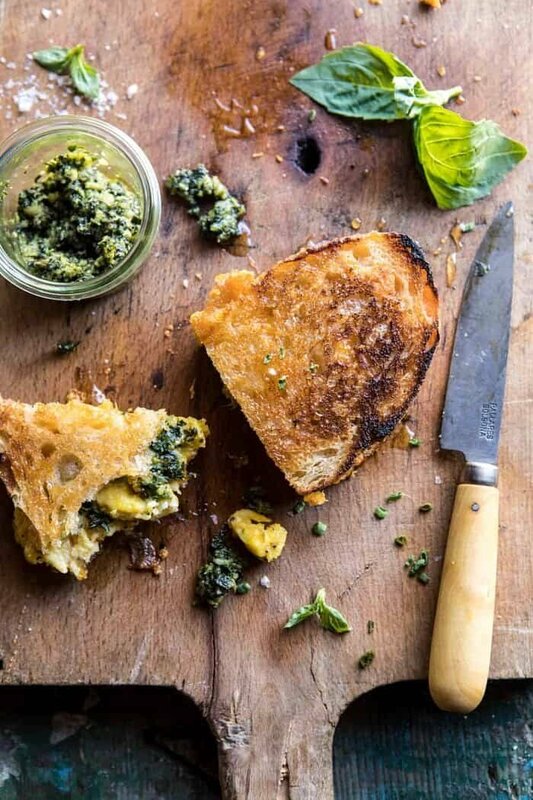 Soft scrambled eggs, fontina cheese, and basil pesto all sandwiched together between two slices of sourdough bread, then pan cooked and finished off with a drizzle of sweet honey. 1. Whisk together the eggs and a pinch of salt in a medium bowl. 2. Melt 1 tablespoon butter in a large skillet over medium heat. Add the eggs and cook, undisturbed, until a thin layer of cooked egg appears around the edge of the skillet. Using a rubber spatula gently push/move the eggs around the skillet until fluffy and barely set, about 2 minutes. Immediately remove from the skillet and sprinkle with crushed red pepper flakes. 3. Spread the outside of each slice of bread with butter. 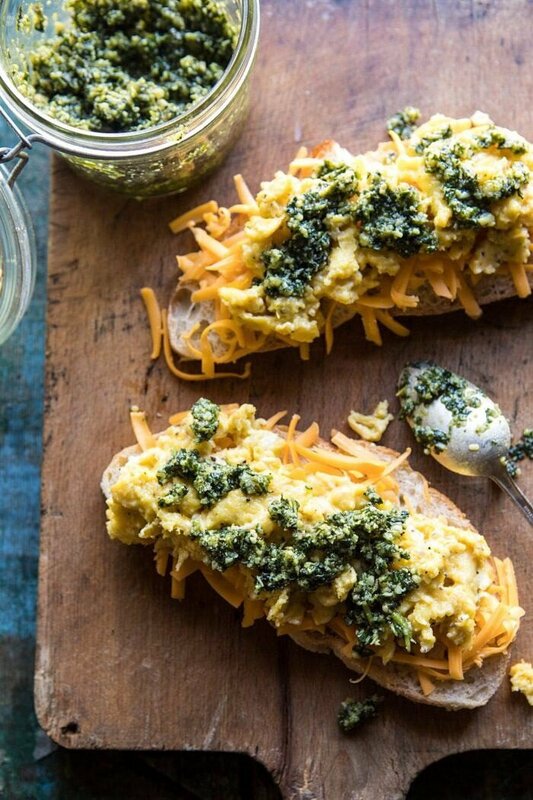 On the inside of half of the slices of bread, evenly layer the cheeses, eggs, and pesto. Add the top piece of bread, buttered side facing up. 3. Place the sandwiches, one at a time, in the skillet and cook until golden on each side, about 4-5 minutes per side. Serve topped with chives, honey, and sea salt. It’s grilled cheese for breakfast! Yes. Yes. YUM! Honey Garlic Korean BBQ Grilled Shrimp. Looking for Homemade Food ? Get the app! I could have this right now, that’s how hungry this made me!!! Great idea for a breakfast sandwich. Wish I had one right now. So inviting meatless lunch ! Thank you ! This looks amazing. I will try this on the weekend. Thank you. I am so glad you like this Brittany! Thank you! I want to make your graham ice cream and recipe calls for 1 sleeve graham crackers. In my country we don’t have graham crackers and I’m going to make homemade ones, but still don’t know what sleeve of crackers means. How many grams or ounces is it? Seeing this sandwhich on your Instagram story motivated me to get out of bed today….this breakfast is the perfectbalance of harmony between sweet, salty, buttery, and fluffy. 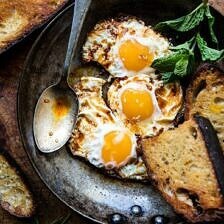 I loved the delicate eggs and the touch of honey on top of toasty bread. I think sourdoughs would have been the perfect bread for this recipe but I used whole wheat I had on hand and it was almost as good. This breakfast sandwhich put me on cloud 9! I am so happy to hear that you enjoyed this Rika! Thank you! These were absolutely fabulous. All those flavors were delicious. Sorry, no pic. We ate them before I noticed your request. Trust me, they were as appealing to the eye as they were to my tastebuds. Thanks for sharing. I am so glad you loved this Cheri! Thank you so much! You obviously need at least one cat. Most animal rescue units need homes for feral cats.We have a gopher problem in our garden and solved it with three feral females.The males we were supplied with ran away, but the girls love it here. Thank you so much Malcolm! There is an old saying that the second mouse eats the cheese. 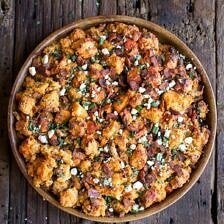 Great pictures and recipes. Thank you. Now, that’s a cheese sandwich I will go for. Looks simply fabulous. I made this for lunch. My wife LOVED it. It will be better next time because I forgot to add the honey…aargh. This is just what I needed to get rid of some of my basil I’m growing! It’s overtaking me! 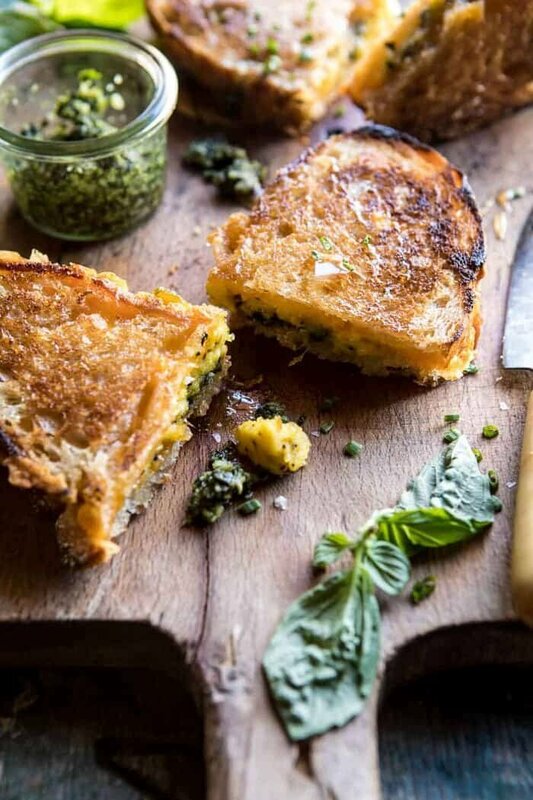 I also love an excuse for a good grilled cheese! 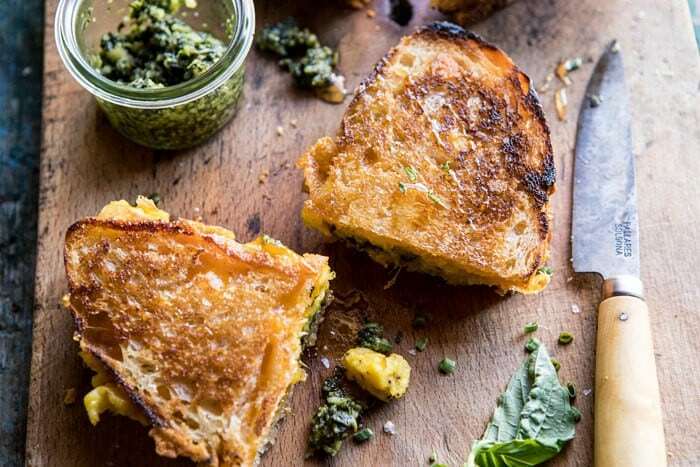 Such a perfect grilled cheese idea for the weekend – I love the pesto! OMG, this would have been my childhood self’s DREAM breakfast. Grilled cheese: bread, cheese, salty, melty gooeyness were ALL my favorites! I would love to perfect a vegan grilled cheese someday. Heck, I totally would love to make a grilled peanut butter and jelly banana sandwich for breakfast! Oh, my gosh! Hurt me! I haven’t cooked a really delicious hot breakfast in so long, I think hubby would pass out if I did! Hi Jane! I hope you love the recipes in the book and yes please let me know what you make! Thanks for the answer! Ice cream was delicious, especially with a slice of your cherry pie! I had extra time this morning so with it being Friday, I decided I must make this breakfast sandwich. As to be expected with HBH recipes, it was an unexpected but welcome flavor profile. Loved the mix of sharp cheddar, pesto and honey. Will definitely make again. This was REALLY good! I love pesto! I was skeptical about the honey, but I just added a little drizzle and I’m so glad I didn’t leave it out! Thank you Coby! I am so glad you loved this! Yum!! I didn’t have basil or pine nuts, so I used parsley and walnuts to make my pesto. 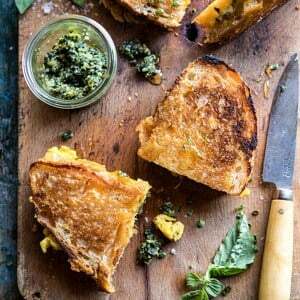 I would have never thought of adding pesto to eggs to a grilled cheese. Magical. Thanks for the recipe! Thank you Karri-ann! I am so glad you loved this! These were so delicious! I added a little bacon to mine. I ended up halving the recipe because it was just me, then making a second sandwich because it was SO good 😉 ! Thank you so much Bailey! I am so glad you loved this recipe! just made this, and it. was. UNREAL! so good I forgot to take pics. next time! I am so glad you loved this Melissa! Thank you so much! Made it this morning and omg, so fabulous. I’d pay for this thing at a restaurant. Thank you!!! Wow that you so much Kate!